Well, the update for the weekend has improved since I checked at the beginning of the week. Not by much! Although they have been announcing rain every single day, yesterday was quite dry. This morning is very sunny, so that is good news. Unfortunately, another cyclone has formed about 1000km off the Queensland Coast. At least it is moving away, but as it builds up we will get more rain and wind. This weekend is not a boating weekend, yet again. Lucky I have a wedding to plan and Ryan has to work. Sadly, a spearfishing competition we were looking forward to on Sunday has been cancelled. Do you remember my post where we asked for your help to choose a tropical holiday destination? We received some great advice including: Papua New Guinea, Solomon Islands, Fiji, Samoa, Bora Bora; and an offer to sail in the Med with Bailey boat cat! We are trying to stay a bit closer to home, so somewhere in the South Pacific will probably be our choice. 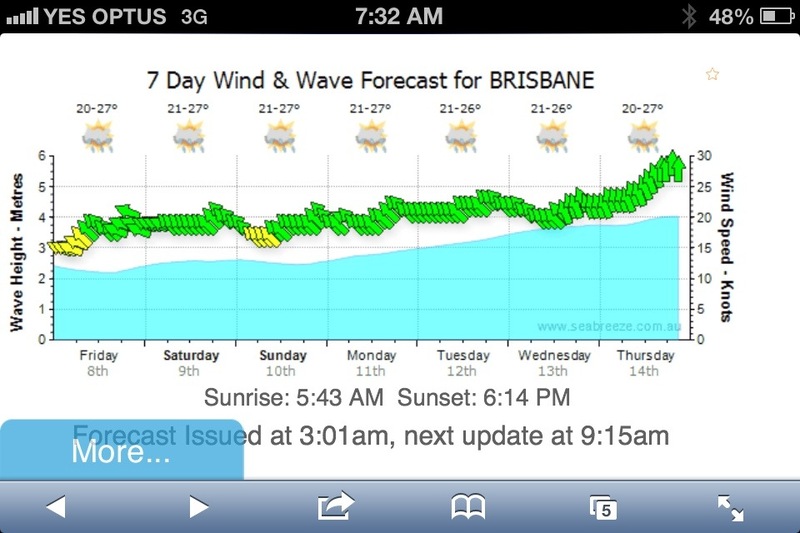 Unfortunately PNG and the Solomon Islands have the wrong surf season. If anyone is willing to give up their space at Namotu or Tavarua in Fiji please let us know. They prioritize their bookings for persons who stayed there the year before, which makes it almost impossible to book time there.